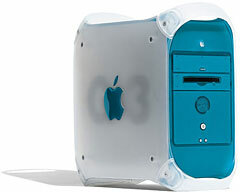 The Blue andWhite was the first Mac with a FireWire port and the first Power Mac with the “drawbridge” case design that Apple used through entire series of G4 Power Macs. It has an ATI Rage 128 video card on a 66 MHz PCI bus (twice the speed of regular PCI) and also has three 64-bit PCI slots (regular PCI is 32-bit). After removing the troublesome RAM, I ended up with 384 MB. This computer has two hard drives, an 80 GB 7200 rpm Deskstar, which is one of my favorite drives, and a 60 GB Maxtor DiamondMax Plus 9. Each drive is partitioned and has Mac OS X 10.2.8, 10.3.9, and 10.4.11 installed. I have an Apple mouse and keyboard attached and used a 17″ Samsung 700DF monitor at 1024 x 768 resolution and millions of colors unless otherwise noted. Only the Deskstar drive was benchmarked. The system was tested on 2008.03.18 using Mac OS 9.2.2 with its default set of extensions and control panels. The computer was attached to a 17″ color monitor and tested in 8-bit video mode at 640 x 480 resolution. Virtual memory is off except in the third test. Results are relative to a Quadra 605, which rates 1.0. Numbers are rounded off to one or two decimal places. The best overall results are achieved with the default 8 MB disk cache and virtual memory disabled. Virtual memory is turned off. Results are relative to a 300 MHz Power Mac G3, which scores 1000. The system was tested with both minimum and maximum cache sizes. cache     CPU   math   disk   gr. There’s virtually no difference between the math and CPU scores, but you can easily see how much a larger cache boosts the disk test. Our advice: Leave it set to the default setting in the Memory control panel. The system was tested on 2008.03.18. Running OS X 10.2.8 Jaguar, it displayed 1000 windows in 95.4 seconds. The same test took only 64.5 seconds under 10.3.9 Panther, and just 48.6 sec. in 10.4.11 Tiger. Apple has definitely been improving graphics performance as Mac OS X has moved forward. This program creates a fractal pattern, which can really bog down a CPU. It does not run under Jaguar. Under Panther, it took 49.6 seconds and scored 287.6 Mflops. Under Tiger, the test took 50.0 seconds and scored 285.3 Mflops. We can see where Apple has been tweaking Mac OS X over the years. The overall score is about 10% higher under 10.4 Tiger than 10.3 Panther, but some scores are even better (especially User Interface) while others are lower (CPU and threads), showing where Apple is putting the focus as it moves ahead. Geekbench only runs in Tiger and OS X 10.5 Leopard, which doesn’t run on G3 Macs. Scores under OS X 10.4.11 are 240 for the Integer test, 230 for floating point, 120 for Memory, 82 for Streams, and 196 overall. While Mac OS X keeps getting better, G3 hardware is being left further and further behind – and it has been completely abandoned with OS X 10.5. Still, this old workhorse from 1999 performs admirably, and I haven’t even tried to overclock it yet.